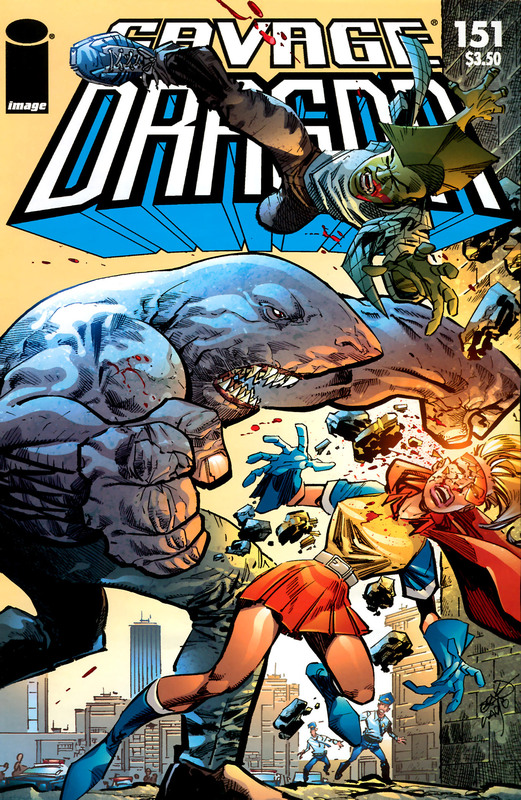 Daredevil is punched aside as he attempt to bring down a rampaging Mako, ending a very brief confrontation between the pair. The hero is unaware that Angel Dragon is looking up images of him on the internet, earning mocking from her brother. Malcolm teases her about her crush for Daredevil before she jumps on top of him, threatening to hit him. This intimate contact excites Malcolm, causing Angel back away quickly from her aroused sibling. A knock at the door ends the awkward moment between the pair as Captain Stewart arrives to inform them about their father. He reports how Dragon was seemingly killed during a confrontation with OverLord before taking the youngsters to the scene of the murder. Stewart details how video footage has been retrieved which features the brutal conflict. Malcolm is confidant that his father will regenerate from his injuries, despite the police captain’s attempts to get him to accept the death. Mako continues to walk through the streets of Chicago and his progress is reported through the media. The Little Wise Guys hear this broadcast as they struggle to get their television working. When they hear that Daredevil is involved in the Mako incident they race towards the scene. Dart is still with them and just hearing Mako’s name unsettles her. She reluctantly accompanies her young companions who are wondering amongst themselves as to what has happened to Jock. The police radio reports the progress of Mako and is heard by Malcolm and Angel who volunteer to help bring down the villain. Captain Stewart tries to get these untrained children to abandon their foolish actions but they ignore his pleas and race over to confront Mako. They arrive in time to witness Daredevil renewing his assault upon the villain. He is quickly knocks out by his target which prompts the children to join the fray. Malcolm’s initial lightning punch to the head of Mako is shrugged off and he is caught in his opponent’s grip. Mako comments how Dragon never managed to defeat him so the chances of his adolescent son doing any better are minimal. Angel races to her brother’s assistance but Mako overpowers her, declaring that he has no wish to fight any children. The Little Wise Guy’s take the opportunity to drag Daredevil to safety as Dart cowers away from Mako. As the battle rages on, Mako announces that he never meant any trouble as he was simply going to an old folks’ home to pay a final visit to his dying mother. His mere appearance caused people to panic which ultimately led to his rampage, borne out of frustration. The villain makes a final plea to be left unmolested while he sees his mother but the damage caused during the fight causes the hospital building to collapse and kill everyone inside. Mako punches his way out of the wreckage before digging through the debris to uncover the corpse of his mother. He is overcome with grief as Malcolm and Angel attempt to apologize for their part in this event but they are struck aside. Mako blames the children for the death of his mother before storming off in a rage. Dart watches on and makes sure that the Little Wise Guys do not draw any attention to them so that Mako does not vent his frustration upon them. Charlie Hendrix and James Peterson are confused as to why the United States Army would require the help of two teenagers. General Pike explains that as they are the only people to have ever survived the Hot Zone unscathed then chances are that the alien they encountered before will not target them again. Charlie is eager to sign up as he blames the aliens for the death of his father while James is unwilling to simply abandon his girlfriend. General Pike leads his two new allies to a chamber where Ethrian’s corpse is being stored. He recites a story about how the local sheriff had discovered the existence of this alien and ended up being killed, the first of many to fall when they got too close to the alien tower. The story about the meteor is somewhat true as Ethrian’s impact when he abruptly died hit with the same force of a meteor and caused an incredible amount of devastation.